Meanderings and Reflections: How long?!?!? The day someone advised me to save water (now, this is a very long long time ago), I started using water judiciously. Inspite of sometimes spending that extra little time gambolling in water, my guilty inner mind quickly makes me come away. Somehow the thought, "What if the water table depletes and invariably my action was one reason for the depletion" causes me to save water in whichever way I can. But I cannot help thinking, How do I know that my small actions of saving water are indeed useful? Am I validated in my saving water? How long should I do this? While pondering over these questions, I don't seem to get any plausible answers. The same goes for saving paper, power, etc.. Somebody told me that any plug shouldn't be allowed to remain in the socket after use. I religiously follow that advice till date. When I try to pass on the information to my cousins and friends, they laugh me off. The very sight of chargers clinging to the sockets after use, drives me into a frenzy. Sometimes I wonder why I do these things so very religiously. Do I do them because I believe that my small actions will bring about a change or Do I do them because I ought to do them. But the word change in this context always petrifies me. Does the change really happen? 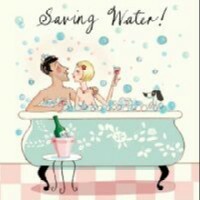 Saving half a bucket of water -- Does it bring any change at all? I can hear many of you jumping up and saying, Ofcourse, it matters but how do you know. Maybe one should just believe that it will make a change but the word believe also means that the chances are 50-50! The words believe, trust and hope have an iota of uncertainity in them. Don't they? But still we hope, trust and believe that we saving that water would help in some way. And that disconnecting that charger after use will help in some way. It is indeed frustrating doing things that we are unsure of but still do it anyway because it seems right and ethical. Now, how is ethics connected to saving water, I wonder. Have elements of doubt accosted you while you were just thinking that you will spend an extra five minutes in the bath allowing yourself to enjoy the water? Please assure me that I'm not alone in thinking so. This is what would happen if each one of us doesn't make a change now.. I am ofcourse making a change. I am just wondering if it matters at all. Thanks for stopping by, uncle. Nikhila, glad to know that I am not alone. I guess once in a while it's okay to indulge our whims but whims should be occasional, I reckon. Ofcourse you are not alone...I am like you. Glad to know that, Janu. Hmmm. I am like you too Susan. However, I don't think my action is driven by ethics. What is ethics anyway? Everything boils down to selfish survival at the end of the day. I think my action is driven by perhaps fear; My sister calls it 'deprivation' mentality. I always have this nameless anxiety whenever I make an expensive purchase. She, on the other hand, doesn't care. Somehow I always seem to think that the resources in this world are never enough and probably am secretly scared that someday it might all get exhausted. Imagine a scenario. We keep sacrificing our little joys for a larger good - in this case to conserve water. What if, a few decades after our death, there is this astounding invention that can create water from nothing. There is no more need to ever worry. Then, all our efforts have gone waste right? No, not selfish survival always, Sindu. If we are selfish, the thought of saving will never enter our heads. Thankfully my conscience is limited to water, electricity and time. Not money!!!! Even if our efforts have gone waste, it doesn't matter as long as we are in the loop of having tried to contribute. That's much better than having done nothing as all. It was nice reading this because now I know I am not alone either. I struggle with the same doubts. I live outside the city so I have to transport all my recyclables to dumpsters outside department stores in town. It's a pain to do, and often I wonder if I'm not wasting my time. The same goes for other acts of ecological conservation, like taking short showers. I continue to do it because I think that once you know something, it changes you. I assume those who do not cooperate with our ecology are ignorant about the dire consequences to the earth's future. But I know better and if I don't follow my own conscience, then I'd have trouble with myself. Thanks Myrna for assuring me that every one of us go through these inner struggles. Sometimes it feels great to have company when one is trying to justify something. Hey Susie, i try saving as much water as i can (though i must admit i am more of a stickler when it comes to electricity). i think the reason i do it is 'cos i wonder what we'll all do if we run of water during our lifetime. the reason i skimp on electricity is cos of the freaking enormous EB bills :D. But seriously speaking, electricity is a precious/expensive commodity and hence! Quite right. Everything ought to be saved. I wonder if we had no notion of the environmental depletion an so on, would we still do the same saving! Doktor, I appreciate the speculation of the historical aspect of the problem. But this whole game of conservation, I reckon, began recently. I don't remember doing all this when I was, say, ten years old. Only now everywhere we see, Save Water, Save Power and Save yourselves! And the thrifty gene, you are talking about should be uniform, right. Why am I not thrifty in certain things than others? As for the first world countries, even they are conserving (atleast some) water and energy since we all occupy the same planet. I do that. Always worrying about water and electricity. I cant bear to leave the light or fan on when I am out of a room. I think we do these things because we were brought up to do them. I dont even know if doing them makes any difference to the larger picture but we do them anyway. I guess it does make a difference -- Better to think that way otherwise our actions have gone waste!!! NOOOOO. Ahhhh we love to have control, don't we? to know that what we do has an immediate effect, the cause and effect we can't get away from. I wouldn't call that control but a genuine thought into the logistics so that my actions are justified. I appreciate your honesty, Myriam. There are many who do it out of fear, being judged "Non-environmental friendly." A scientists I am NOT. I understand though, that our planet is pretty well self-contained, never "leaks" water into outer space. Everything here STAYS here, maybe changes , but is still...HERE! As I fly over the ocean, I cannot help but say to myself, "See? All that water out there I helped to 'save'--grin-and-still-grinning! I firmly believe the greatest rip-off in the world is sales of 'bottled water'. God HAS to be laughing over that one! As usual, Susan Deborah, you push us all to think about these topics you raise, and I say that is WONDERFUL! If an ocean liner/aircraft carrier can De-salt plenty water for drinking, etc., we ALL could. Ask me, "Where do we get the money?" Ha, this comment would become a book before morning! SD, you don't want to know how I help the water table to keep its level--or DO you--LOL! You are being quite practical, Steve. There are many ways of making up for lost water but the problem is that all of us have a role in the process. Our planet is self-contained but it also needs a wee help from us to contribute to being self-contained. Due to my extremely non-scientific research, I have not fallen for that line of world-wide Liberal thinking, e.g., I am harming the earth, etc. Bureaucracies have been built around these myths of alarm--which alarm allows the bureaucracies to expand themselves, and assume power over individual freedom WAYYY more than the reasons they came into being. I wish I have much more space to write what I think--the minority voice still IS important, yes? As for water, I do not think the earth leaks water into outer space..HA! Everything stays right here, and goes into our atmosphere, then "...droppeth as the gentle rain from heaven--upon the place beneath..."
So Susan Deborah--you DID ask, Babe! Right? I still love ya, and send peace to you and yours! I am guilty...sometimes I try to do the right thing, but I have bad habits that are hard to break. My wife is constantly telling me to turn off this or turn off that. As always, you make us stop and think. Thought-provoking post. Thanks for sharing. All of us are guilty of something or the other all the time, Andy. You have a very resourceful and wise wife. Glad that this post provoked you, Andy. The provoking is what I intend this blog to do! As long as the water is not running, you are not using any more water if you stay in the bath 5 extra minutes, are you? As for the uncertainty, a very good friend of mine used the phrase "deomstrate to the universe", a somewhat karma-like concept. If we wish to unfold as someone who is ethical, we need to "demonstrate this to the universe", meaning in this context "even when no one is looking". If we do it only for show we are just being vain and looking for social strokes, not out of any sort of real desire to be someone ethical. Loved your comment, David esp the "karma-like concept." And, when we are bathing, we are always alone, so that's the time we need to be judicious (winks). There are times when you are doing something and you ask yourself whether you are really making any difference. But at times I comfort myself in the knowledge that there are many others out there doing the same so collectively we are making a difference! Thanks for this wonderful thought, OtienoHongo. You have rested my restless mind. Susan, just wanted you to know I mentioned you in my blog today - the Sunshine Award is yours. It's like a dripping faucet. One drop doesn't really amount to much, but taken together it can fill many buckets. If only each one could be as conscientious as you in preserving water, then the impact in our total consumption will be tremendous. I also unplug appliances as a habit. It's a must here because power outtages are quite common. That initial burst of electricity when power is restored can have detrimental effects on appliances and electronics. There are good and bad habits, Age and I guess this whole 'saving' habit is a good one, irrespective of the outcome. Glad you pointed this out as I never saw through this as a habit or regime. But come to see, it is a habit that we have conditioned ourselves to and that which is hard to change. I can definitely relate, Susan. I had my doubts too, whether the things I do would really have an effect. But you're right, it takes faith, and sometimes, we just do it because it felt the right thing to do. Faith! Right said Joyce. And we definitely do it because we know it's the right thing to do. Thanks for reassuring me, Joyce. It has put things in perspective. I truly appreciate your thoughtful (and thought-provoking) authenticity! You are so refreshing! My ex-husband used to attack me constantly because I flush the toilet too often, use too much toilet paper, use too much water washing dishes or washing my hands (he never washed his hands -- yuk! ), etc., etc., etc. I hit an all-time low in self-esteem during that marriage! And, did all that anxiety save the world? No! It did not. I try to be careful and useful to society as best I can. Beating people up does not help. Linda, thanks for the sweet words. You had me smiling. That anxiety would have brought some change, Linda without you knowing it. When the whole "saving" game becomes an obsession, it gets dangerous, I reckon. Sometimes I get all hyper and my husband grows irritable with me. But now I have learned to fret less. The fact that you do something, which would have an impact in the long run, is indeed commendable. You do it, because you want to make a difference. No one can question you, coz you yourself abide by the things that you feel others should also do! What stuff is humour made of?